I did not win the final race of the season. It had been raining every day of the week including race day in that twilight time of year between winter and spring. The Honda Pilot was wiped clean as the rain and the speed acted as a car wash to brush away the dirt from the last race. The parking lot lakes at the racetrack were wide, but I found an area to park that was fairly dry. I had been debating in my mind with the idea of even racing today because of the sloppy conditions. Maybe I could just show up later in the day to pick up the season championship trophy. I had raced all 10 of the races so far and wanted to at least say that I had completed all races of the season. Even though I had clinched the season championship after the 7th race of the year. I wanted to be there. I had nothing better to do. There are few if any things better to do on a Sunday, than race. It is better to do it on a cool sunny day though. John, the season champion the past two years pulled in after me. I slogged my wheelchair over to John and looked up at the rain and down at the puddles. He said, "Have you signed up yet?" I replied, "Not yet". "If we don't sign up then we wont have to race,” he answered back. I waded through the puddles and went over to check the point’s standings and have a closer look at the track. The track is 100% sand and always hid the water well. Little puddles here and there, but underneath the top layer awaited a dragon to uncoil and pull you in. I saw the 4-foot tall season championship trophies all lined up underneath the grandstands to keep them dry. I wondered how the trophy might fit into my sports car. I might have to strap it onto the trailer, or maybe I could...I started to feel the underlying challenge by John, and waited in line to sign up for the race. They handed me the empty coffee can with numbered poker chips inside. I picked #39. This in theory would probably give me the pole position for the qualifier. It didn't matter where I started as long as John was racing. John had a three-cylinder 660cc modified Polaris snowmobile engine with pipes and carbs crammed into his vehicle with 120 HP on tap. I had a modified 400cc single Honda Pilot with 60 HP to propel me. I had been closely watching the starter every race of the year. He was consistent. Every race he started with the same motion of sweeping his hand across the line to make sure everyone was ready to go, and then he would take one step forward. The flag was pointed down on his right side, but before he raised the flag he would dip the point of the flag just about an inch before he unfurled it. The worst mistake of a starter is to be consistent. I knew him now. I knew when I could jump and have that fraction of a second over the rest of the field. The other racers probably also knew. It might have been the smallest amount of cheating, but unless I was caught it wasn't cheating, just racing. I went back to John and told him that I had signed up. He didn't look all that unhappy, sort of relieved that someone else had made the dumb mistake of signing up, as long as it wasn't him. We jointly agreed with few unspoken words between us that we would skip the practice session and concentrate on the qualifier and final race. That gave me about an hour and a half to kill in a pouring rain, so I did the natural thing and hid in my car until close to race time. I had to make sure that I stayed awake this day. The previous race we had finished practice and had a little less than 2 hours until the qualifier. I stayed inside the Pilot, took my helmet off and rested my head against the side safety netting. Amongst a sea of screaming two strokes not more than 15 feet away. I fell asleep. John started shaking my shoulder and told me "Were up in two races, get ready". I replied with a groggy "Huh!” "You fell asleep and the other racers and I almost pushed our Pilots to the starting line and left you sleeping" John said. With a little chuckle he added "but we decided to be nice to you". I beat them that race and couldn't depend on them waking me up again. The qualifier was a nightmare in mud. I finished second behind 120 HP of wheels blowing me with mud. I was a mess, a bloody mess. After taking off the gloves, goggles and helmet I looked down at my bright red coat and brilliant blue racing harness to see only a light brown. Not only had the colors vanished, I had lost my harness, but I still could not move. 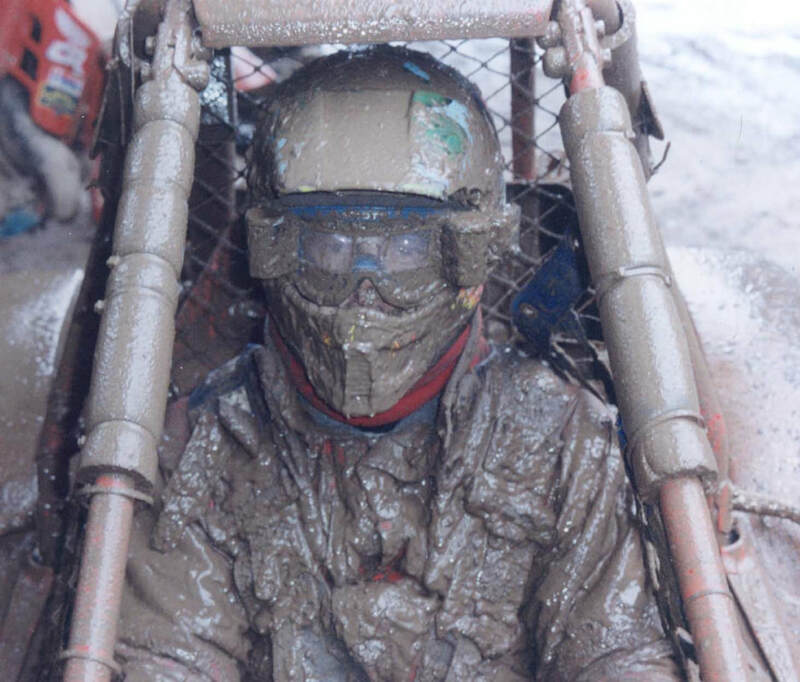 I could not even see the outline of a harness under the mud. I groped with muddy hands and found the straps and was able to release myself. The remaining hours until the next race were spent carefully cleaning the goggles so that they would work once again. This time I did have a plan for the final race though. I would pass him on the inside of the tabletop and let him eat the mud he so richly deserved. I kept my secret strategy to myself. The surprise on his face when I pass him will be tremendous, I thought. The race began as the qualifier had with John leading and I closely following. The tabletop was coming and I moved to the inside of the course to make the giant pass. Things at this point become fast in my mind. The track was so slippery on the inside that it threw the Pilot completely sideways as I launched off the jump. For the only time of the day I was able to clear the jump, albeit sideways. For a brief second before landing I thought that I was going to flip the Pilot and make the spectators day, but I didn't. I did go through the banners and apparently chased a plump flagger boy around the track. In the remaining laps I caught up to John in some of the best driving I have done while nearly blind, but I still lost by 40 feet. The strange thing is that when landing sideways from the tabletop jump I didn't feel scared, frightened, there was no adrenalin rush going through my body, just quietness. Then I had always felt that way when crashing and there was nothing you could do, except wait to slow down and stop. Crashing was the end of the race. It was failure. The other racer almost always has the faster line and you must take a slower one to pass them. You cannot pass over another racer. You must pass around them. Without trying to pass someone there is no race. On the way home I called my friend Bruce on the car phone and told him about the race as was usual. Bruce would always after listening to me say “Did you have fun?” I told him "Yes. It was beautiful"